COLAB are offering free courses in September for people undergoing Recovery. 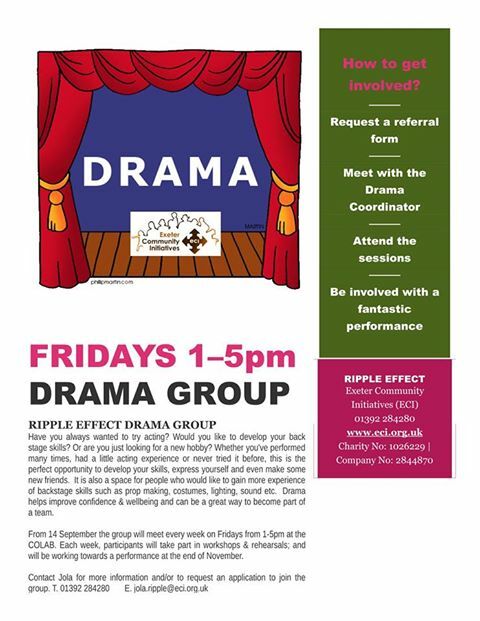 There will be a Drama Group and a Mindfulness Programme, all part of the ECI Ripple Effect Project. Are you or anyone you know going through the RECOVERY process at the moment? Would you or they be interested in joining some FREE new groups being set-up as part of ECI’s Ripple Effect Project? 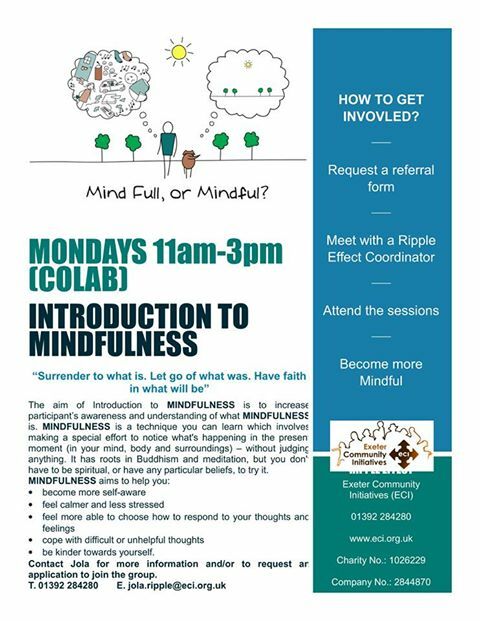 We have a 6-week “Introduction to Mindfulness” programme starting on Monday 10 Sept @ 11am at COLAB, King William Street, Exeter EX4 6PD. We also have a 12 week “Drama Group” starting on Friday 14 Sep @1pm also at COLAB which will be working towards a performance at the end of November. Both run once a week and are FREE to anyone going through the RECOVERY process – this can be Recovery from drugs & alcohol, mental health, illness, relationship breakdown etc. to request an application form and get signed up. Exeter Community Initiatives is a local grassroots charity working with anyone at risk of homelessness.